Did Google just nail the Age of Context at I/O? In a recent post I outlined the upcoming Age of Context, an era in which the combination of the prevalence of smartphones and sensors combined with the low-cost access to AI algorithms would enable seamless services and experiences. The accelerated proliferation of wearable computers in the form of smartphones and smart watches. The integration of on-device data with the massive amounts of sensors around us. The lowering-cost and advances in machine learning and deep learning algorithms to turn the data produced by the above into actions. A meta-language that ties in the millions of apps to share context and content. A transaction enablement platform to help us take data and insight into action and eventually transaction. In yesterday’s Google I/O keynote, Google announced a number of new products and features that seem to address each of the points above and potentially gives Google a leadership position for the Age of Context. In terms of proliferation, Android continues to lead the charge in the democratization of smartphones with over 80% of shipments. Android Wear continues to scale with 720k shipped last year and over 4,000 apps available today. In terms of access points for the Age of Context, Google is far ahead. With an estimated 16 billion IoT devices around us today, and an expected 40 billion by 2020, sensors are clearly all around us. Today each of those sensors works on a different embedded system. These devices, therefore, can’t talk to each other, or to other platforms. 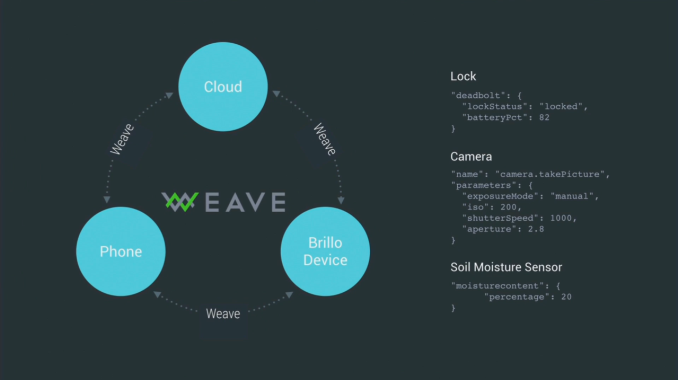 At I/O Google announced two products that adress this: Brillo and Weave, a new OS for IoT and an inter-device communications layer. With Brillo not only can an Android sub-kernel run across billions of devices but with Weave, a Google-supported API could become the lingua franca of Machine to Machine communications. 3. Critical to the Age of Context is the ability to make sense of the reams of data being generated. This ability has been accelerated recently by advances in machine learning combined with the near-negligible cost of data storage and computing. In my original post I pointed to Google Now as a basic example of what will become possible, but I also criticized Now for being Google-biased and Google-centric. One of the most exciting announcements at I/O was Now On Tap which takes the AI engine of Google Now and rather than open Now to other apps, it brings Now into Apps. It allows the context of the app to be passed into Google’s AI engine and for Google’s vast repository to add value within the app. So a conversation about dinner might tap into a restaurant database and enable a seamless booking via Open Table all within the context of a chat. 4. In my original post I argued that who would own the interconnections (deep-links) between the app economy would own the new age of context and that he battle lines were being drawn now with Facebook, Google, Yahoo and a number of startups all seeking to defined a standard to control the modern equivalent of hyperlinks. At I/O Google pimped up it’s short links to expand deep links across both Android and Google. 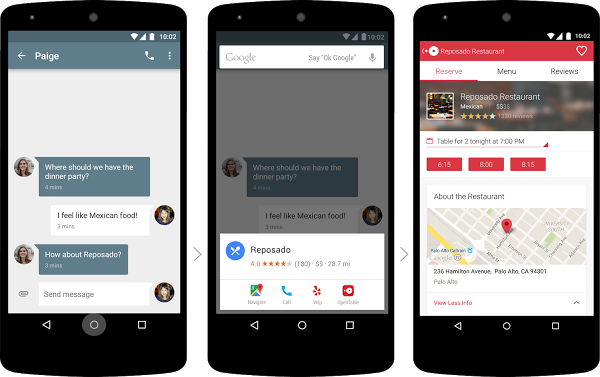 But Google went one step beyond just deep links and focused on integration, collaboration and action across apps through Google Now/Now on Tap, Weave and Android Pay. Google drew a line in the sand to evolve its business from the blue links of the web to the deep links between apps, machine-to-machine and enable action across them all. 5. To truly enable the Age of Context we need to go from data -> insights -> action. Many of the services available today have been focused on the transition into insight as the transition into action is sometimes impeded by “action” requiring a financial transaction. At I/O Google announced it’s 3rd (?) 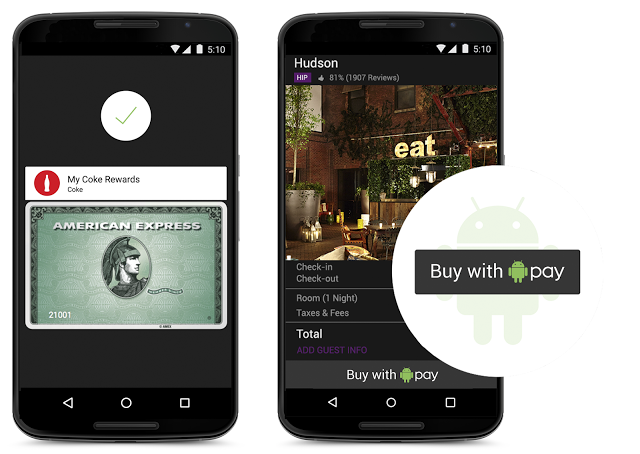 attempt at payments with the launch of Android Pay which is seeks to add the critical identity-enabled transaction layer across the digital and real world. The words “context” and “actions” were mentioned dozens of times during the Google I/O keynote. The product launches seemed to build upon each other to bring together the building blocks of the Age of Context. Google already has a strategic advantage with Android and its “knowledge graph” and the announcements yesterday seem to weave those together to connect mobile apps, sensors, data and turn data into insight and insight into action.